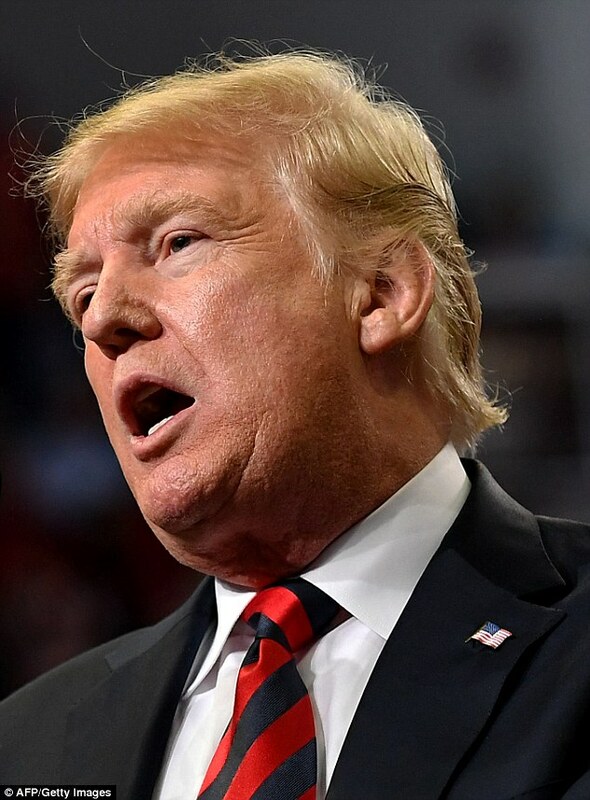 President Trump slammed the 'bad ones' in the Justice Department following reports Deputy Attorney General Rod Rosenstein wanted to wear a wire to secretly record the president and discussed invoking the 25th Amendment. 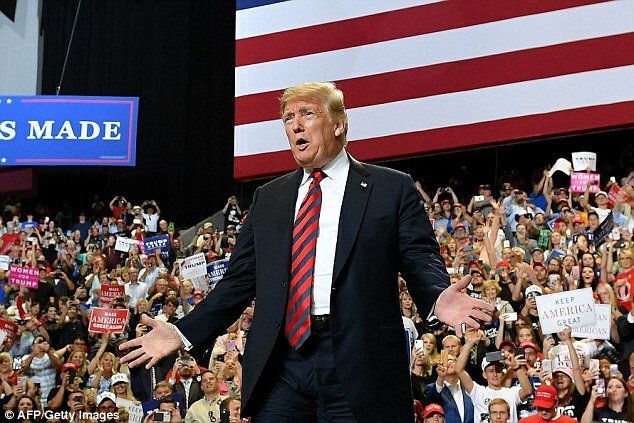 Speaking to a fired-up crowd at a rally in Missouri on Frriday night, he said there was a 'lingering stench' in Justice 'and we're going to get rid of that'. He was in Springfield supporting Republican Senate nominee Josh Hawley, who is running against two-term Democratic senator Claire McCaskill. Hours after the New York Times broke the story, Trump said: 'Just look at what is being exposed in our Justice Department. 'We have great people in the Department of Justice. ... But you've got some real bad ones. You've seen what's happened at the FBI. They're all gone. 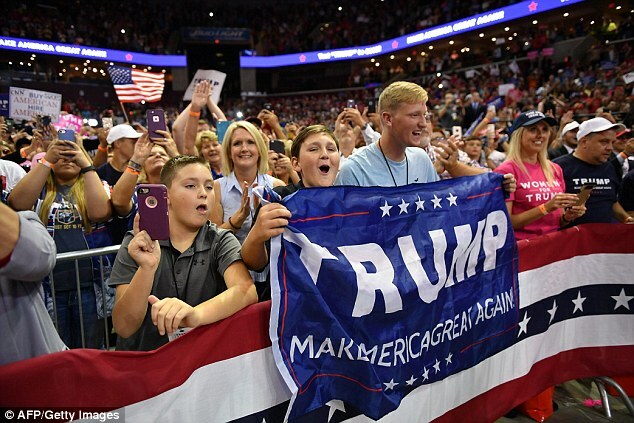 The audience also broke out in chants of 'Kavanaugh' as the Supreme Court nominee faces sexual assault allegations. 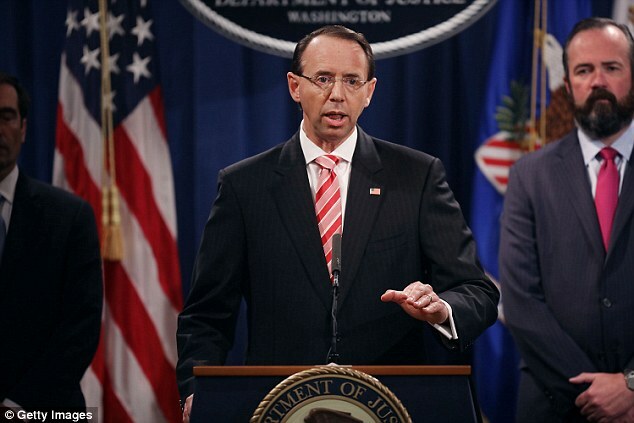 Rosenstein suggested last year that he should make covert audio recordings of President Trump in order to build a case for removing him from office, according to the New York Times report.Rosenstein disputed that account on Friday, and a Justice Department official who was reportedly in the room when Rosenstein talked about using the 25th Amendment to end the Trump presidency says he was being sarcastic. The 25th Amendment allows for a majority of the president's cabinet, or 'such other body as Congress may by law provide,' to decide if an Oval Office occupant is unable to carry out his duties – and then to put it to a full congressional vote. That account agrees with a Fox News report based on sources who were in the room and said the meeting took place May 16, 2017. 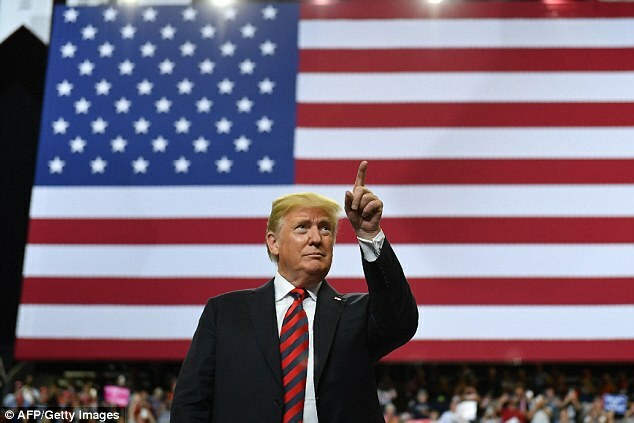 Trump has been campaigning aggressively to help the Senate expand its narrow 51-49 majority in the Senate. He went to Vegas on Thursday night to help Sen. Dean Heller, the only Republican seeking re-election in a state that Democrat Hillary Clinton won in 2016. More broadly, it's the latest revelation that could affect Mueller, the special counsel investigating possible coordination between Russia and Trump's presidential campaign in 2016. Sessions recused himself from that issue soon after he took office, to Trump's dismay, and Rosenstein then appointed Mueller. A number of key FBI officials, including director James Comey and deputy director Andrew McCabe, have been fired since Trump took office.On Friday, Fox also reported that then-Acting FBI Director Andrew McCabe and FBI lawyer Lisa Page were in the room when Rosenstein raised the subject. Page had been half of the infamous texting romantic-affair couple who mused in 2016 about how to 'stop' Trump from becoming president. 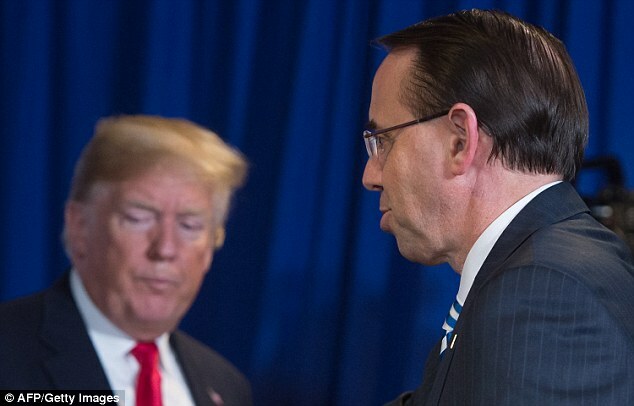 Rosenstein (pictured with Trump in May) disputed that account on Friday, and a Justice Department official who was reportedly in the room when Rosenstein talked about using the 25th Amendment to end the Trump presidency says he was being sarcasticAn Obama-era Justice Department spokesman suggested Friday afternoon that McCabe leaked the story to the Times. 'Dangerous game Andy McCabe is playing right now,' Matthew Miller tweeted. Ari Fleischer, who was White House press secretary during the George W. Bush administration, lashed out separately at McCabe. 'This story reads like Andy McCabe trying to burn down the house he once lived in,' he tweeted. McCabe is himself facing a federal probe over allegations that he misled investigators about the sources of press leaks; Attorney General Jeff Sessions terminated his employment this year, just days before he was scheduled to retire with a full pension. In the Post's telling, McCabe had proposed opening an investigation into the president after the firing of FBI Director James Comey. 'What do you want to do, Andy, wire the president?' Rosenstein chided him, according to one source.